Ever want one of those nifty bonsai trees from Japan? Sure they require proper trimming, care, and maintenance, but those trees add an air of class and make for a great centerpiece. Of course, an authentic bonsai tree from Japan can cost a pretty penny as well. With all those cons against a bonsai tree, the commitment to purchasing one may discourage you, until now. 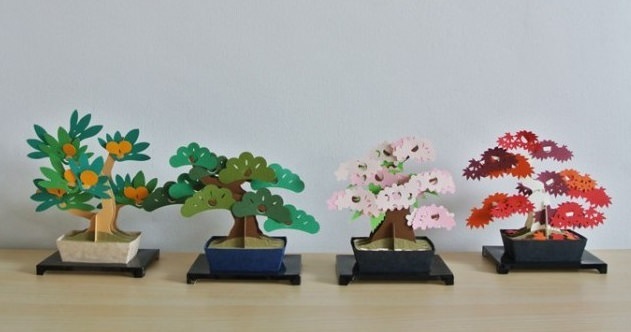 Introducing Kami-Bonsai, or Paper-Bonsai, simple paper-crafted bonsai trees that are easy to maintain and last a whole lot longer than actual bonsai trees. 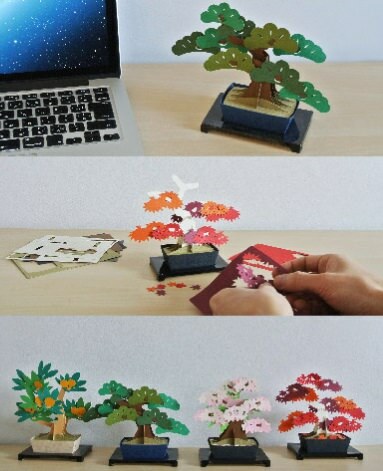 Designed with simplicity in mind, the Kami-Bonsai is easy to put together and comes in various designs. The bonsai has a deep history in Japan, but for many, owning an authentic bonsai tree just isn't a reality. At only 1,620 yen (est 15$), these bonsai trees make for great gifts, or make for being the perfect conversation starter at your next party. Next time you're in Japan and want something easy to bring back that captures the essence of Japanese culture, look no further than the Kami-Bonsai.